Breathing exercises, hypnotism, focusing on positive colours, and encouraging youngsters to imagine writing their worries on stones before throwing them into the lake. It’s not exactly the way Mr Chips would have prepared youngsters for their exams. But Sian Deane, headteacher of Holmer Lake Primary School in Telford, has been using hypnotherapy to prepare her pupils for their exams for three years now, and says the results have been excellent. And while her work is done, with the Year 6 Sats out the way, she says the technique is also perfect for older students currently sweating through their GCSE and A-level exams. “The children appear calmer, happier, and have far more self-confidence,” says Mrs Deane. “I’m in control of my thoughts, they are not controlling me,” says Joe, aged 11. It is not just primary school children who are turning to hypnotherapy to beat the exam blues. An increasing number of teenagers are also using the technique to prepare them for their GCSE and A-level exams. Clarissa says that she has had about 30 teenagers come to her for help with their exams over the past year. “That is my private practice work, aside from my work with schools,” says the 62-year-old. Last year, figures released by the NSPCC showed an increasing number of youngsters were seeking help for exam-related stress, with the charity’s ChildLine providing 1,127 with counselling sessions, an increase of 20 per cent. Reasons cited for seeking help included not wanting to disappoint their parents, fear of failure and the general pressures linked to academic achievement. The charity says stress about exam results can affect young people’s ability to sleep, trigger anxiety attacks, depression, and eating disorders. Clarissa says it was the effect hypnotherapy had an a pupil buckling under exam pressure during her teaching days that convinced her to train as a specialist therapist. At Holmer Lake, there was perhaps inevitably a little initial scepticism, and Mrs Deane says it was important to communicate clearly with the parents what the sessions were about. Mrs Deane says the sessions have been so successful that Clarissa has now been asked to train some of the staff in the techniques to help them give extra support to the pupils. “Clarissa’s programme has proved extremely successful for a number of children with a variety of needs,” she says. Mrs Deane says during the sessions the children are given time to identify and discuss their worries, and how best to manage a range of emotions. A booklet is given to each child to remind them of the strategies when they are at home. Clarissa says teaching children how to relax and control their fears is central to the therapy, as well how to overcome their nerves. The pupils are fully conscious during hypnosis, and are still in full control of their thoughts, she says. “It’s not at all like what you see on the television,” she says. As part of the programme, which has been devised by Yorkshire-based expert Sheila Granger, Clarissa also encourages the youngsters to set aside a “worry hour” in the evening, so they can postpone their anxieties until a specific time of day. Another technique is telling the children to use an imaginary pen to write down their worries on a pebble, which they are then told to throw in to a lake. “The sessions also included breathing exercises, such as encouraging them to inhale positive thoughts and exhale negative ones linked to emotions like uncertainty and anger,” says Clarissa. 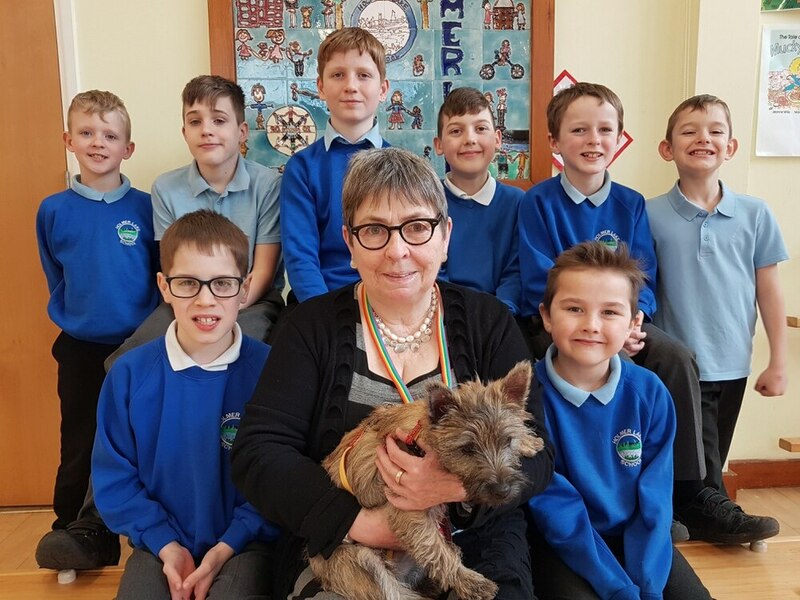 In another departure from conventional teaching practice, Clarissa also brings her pet dog Millie into the school, which she says plays a great role in breaking the ice with the more reserved youngsters. “Some of them don’t want to talk, but they will tell their problems to the dog,” says Clarissa.